DeKalb Junior College became Georgia Perimeter College and the DeKalb honors later became Georgia Perimeter honors. In 2015, the Georgia Perimeter team put seven players on the All-Region team, six of those on the first team. Twenty-six years earlier, in 1989, the DeKalb club put four players on the All-Region team. 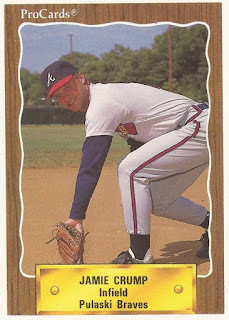 One of those players on that 1989 Al-Region squad was Jamie Crump. Crump went on from DeKalb to turn pro. His pro career, though, was brief. He got into 43 games over a single season of rookie ball, the extent of his time in pro ball. Crump's pro career began in 1989, signed by the Braves as a free agent out of DeKalb, according to his card. He was a native of Alpharetta, Ga. He's also known by his formal name, James Crump. He didn't get into a game until 1990. Crump got into the field with the Braves at rookie Pulaski. He got into 43 games for Pulaski that year. He played mostly at third base, but got some time at first base. He also got into a game as a pitcher. As a position player, Crump hit three home runs, but overall hit just .175. He knocked in 15 and stole two bases. As a pitcher, Crump got into one inning, giving up three earned runs. It was his only season as a pro. Crump appears to have returned home to Georgia. A Jamie Crump is listed as a coach for the 12U Roswell Green Hornets in Roswell, Ga., only a few miles from Crump's hometown of Alpharetta.